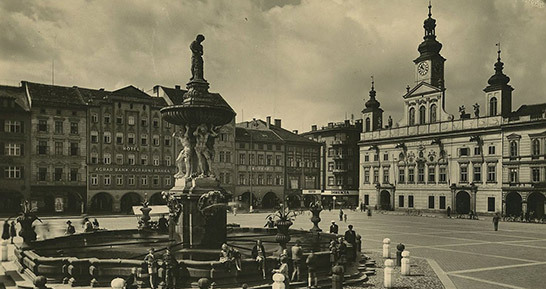 Here You can read about the main events in the history of Hotel Dvořák. The events are divided into three stages, according to the chronological order. In the place of current Shopping Gallery Dvořák in the Přemysl Otakar II Square in České Budějovice there used to be two burgess houses. They were built in Gothic- Renaissance style and connected with an ornamental attic storey. The Gothic origin was demonstrated with arcade archway. In 1868 the fire broke out in west part of the square and at least six other terraced houses burnt down including these two mentioned before. It is very likely that the houses were called U zlatého Slunce at that time. The following year 1869 the owner Karel Čertík had the destroyed houses rebuilt in one building and added two floors in late Classicist style. The new building was furnished and used as a hotel known as U zlatého Slunce. In 1910 Karel Čertík sold the hotel to the Business and Industrial Cooperative (Obchodní a průmyslové družstvo), later known as Czech pawn shop (Česká zastavárna). During the ownership of the Cooperative and thanks to the Bedřich Sandholec´s rent, the whole building was renovated in 1911-1912 according to the project of Antonín Hübschmann. The renovation was influenced by Art Nouveau and Cubism, which were modern styles of the time. At the same time the hotel was equipped with electricity and central heating. In 1913 Business and Industrial Cooperative sold the hotel to the Agrarian Bank Prague (Agrární banka Praha), branch in České Budějovice. In 1926 next tenant Rudolf Dvořák refurbished rooms, introduced a taproom together with a new restaurants, which were known as “Paluba” (Deck) and “Kufr” (Suitcase). The restaurant “Paluba” had original beam ceiling carved in Renaissance style. Last tenant was Rudolf Šindelář. 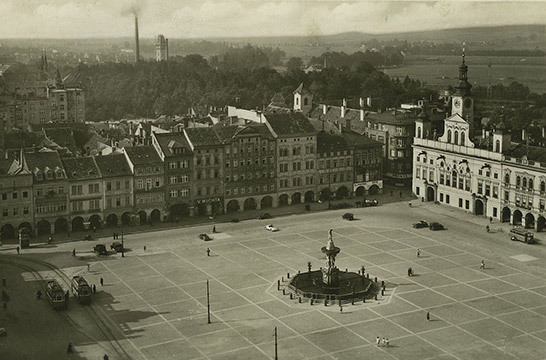 Soon after 1945 the hotel was nationalized and the Šindelář family was forced to leave. 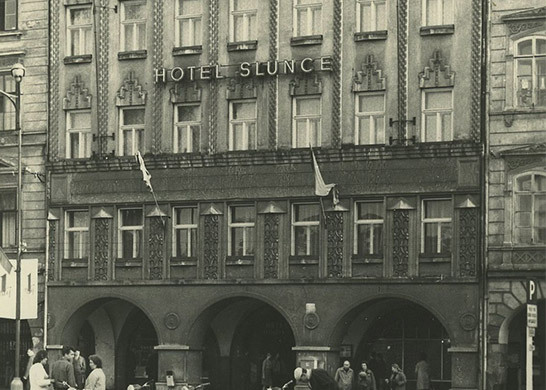 Then the hotel known as Slunce (Sun) was put into a “B” category and became a part of an enterprise called Restaurants and canteens České Budějovice (Restaurace a jídelny České Budějovice). On 1st January 1965 Interhotel České Budějovice was established. At first the operating unit hotel Slunce was managed by Interhotel Karlovy Vary, then by Interhotel Brno. Since 1971 the Interhotel České Budějovice was independent. In the building of the hotel, there was a head office and an administration of Interhotel as well as a hotel and a restaurant. The hotel Slunce together with other hotels in South Bohemia region was included in Interhotel. The hotel Slunce had its own confectionary production in Široká Street and a famous confectionary in archway. On 1st May 1990 after the collapse of Interhotel enterprise, the state company Čedok, which was in charge of Intehotels, started the renovation of the hotel Slunce using its own financial means. The opening of the hotel was assumed to be in April 1993. Soon the lack of finances and unrealistic project resulted in terminating the work on a building site in 1994. An inner house and surrounding houses in Široká Street were demolished and only façade in Nouveau Art was preserved. Čedok offered the ruin for sale but no buyer was found. In 1999 Karel Dvořák a.s., Tábor was seriously interested in the ruin of a famous hotel. The original concept “the renovation of the hotel Slunce” was altered. The new project was called Dvořák Gallery- shopping centre and hotel. On Monday 5th November 2001 at 11 o´clock the shopping Gallery Dvořák was opened. The hotel is named after the owner Mr. Dvořák. Since 2011 the company Hotel Dvořák České Budějovice s.r.o. has been an operator and Martina Knížková has been a managing director.